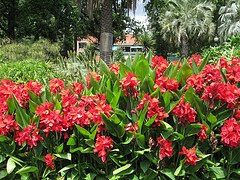 One of the most beautiful places in the City of Boroondara is undoubtedly the Alexandra Gardens in Kew. This oasis of calm and green is situated in Cotham Road between the Kew Library and Gellibrand Street. Visitors to the library can enjoy sitting looking from the western part of the building to these gardens and can wander through them on the way to the junction. 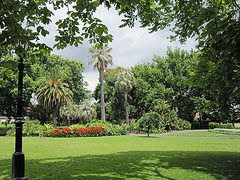 Alexandra Gardens are of historical significance and a "substantially intact park of the Edwardian period and for being one of the few formally landscaped parks in Kew" according to the City of Kew Urban Conservation Study completed in 1988. 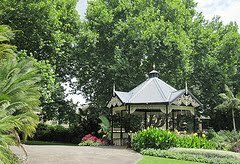 Though a band rotunda had been erected locally in 1863 as a memorial of the establishment of the Borough of Kew, the Alexandra Gardens were an Edwardian creation and officially opened to the public on 8 April 1908 by the Governor of Victoria, Sir Reginald Talbot. The bandstand was erected and opened on 14 December 1910 to mark the Jubilee of the Municipality of Kew and the establishment of the Town of Kew and provided a place for the Kew Band to play a series of moonlight concerts that summer. The Queen Victoria Jubilee Fountain, formerly situated adjacent to the Kew Post Office in the junction was removed from its original site in 1924 to make way for the war memorial and relocated in the north-west corner of Alexandra Gardens. Another pleasant feature of the gardens is the installation of sculptures by local artist Leopoldine Mimovich. 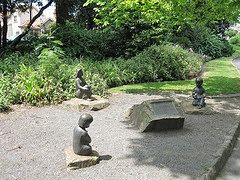 The ten sculptures were given to the people of Kew "for their enjoyment" by the sculptor and were officially accepted by the Mayor of Kew, Councillor Michael Montalto, on 11 February 1990. Another of her sculptures celebrates the reopening of the Kew Library in its current location. Thanks for this blog it was the only way I could find about the sculptures in the gardens.